I proceeded to explain (to the air, yes, I know) that I wouldn’t dispatch the evil pest man in a bubble suit if they, the lurking spider army, would just stay out of our way, and certainly out of my bed. They could have the yard, the basement, and the far recesses of the attic. We got everything else. The house itself prompted this moment of declaration. The woman who lived in our house from 1916 (when she was born) until 2003 (right before she died) was a bit of an odd bird. She was, among other things, a well known portrait photographer during the 60s and 70s, and she had a darkroom in the basement. The darkroom was painted with a variety of interesting illustrations, mostly of enormous and ridiculous looking spiders. These murals were actually far from the weirdest things we discovered in the house, which is why we had the entire house sprayed with Kilz and blessed by a priest before we moved in. I have been irrationally afraid of spiders my entire life, despite knowing that arachnids are more beneficial than harmful, that there are only two types of poisonous spider around here, and that human giants are much more frightening to tiny spiders than spiders should be to us. I don’t know what pact Jackie struck with the spiders during her multi-decade tenure, but as the new mistress of the house I figured I’d better chart a clear course of my own. Since I am actually more afraid of carcinogenic pesticides than of spiders, I decided a loud verbal directive was worth a try. For our first few years in the house, I swear we didn’t see a spider – not anywhere. Then one morning my children alerted me to our first garden spider. She had made a home in the mint bed by our front walkway, visible but protected. We had the house; she, it seemed, was taking the yard. Even I had to admit she was beautiful, with her bright colors and zig-zag web. 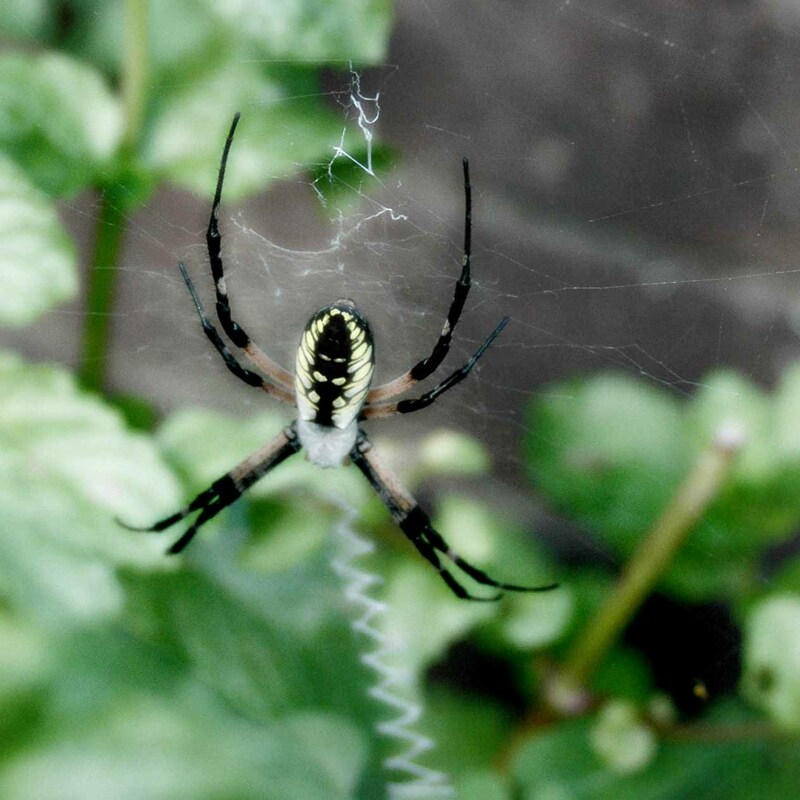 We looked up “zig zag spider” on the Internet and learned as much as we could about our garden guest. Beneficial to plants, eats bad bugs, harmless to humans, etc. We watched her all the way through first frost, when she disappeared. The next year, another garden spider appeared, around the same time in mid-August and around the same place that the first spider had called home. This guest was a bit bigger and more colorful. One morning we woke to find that she had rebuilt her web clear across our front walk, from the gardenia bush to the pampas grass. So I did what any true geek would do: I called the zoo to ask for advice. “Yeah, with the big wind last night her anchor line must have come down,” the zookeeper told me. He then spent 30 minutes explaining the fascinating world of argiope aurantia, commonly known as garden or zig zag spiders. They’re homemakers, it seems, and the spiderlings that survive each spring typically make homes near the web where they hatched. And take this, Martha Stewart: garden spiders rebuild the middle of their webs every night. That pretty zig zag? New and improved, each and every day. An efficient homemaker, however, she typically leaves the main anchor line alone unless it’s disturbed, as was the case in our yard. “Just break the anchor line again, and she’ll figure it out from there,” he advised. We did as he suggested, and the next day she was back in the gardenia bush where she started. All fall we watched her. The children wrote stories about her that made Charlotte look like an also-ran. On Halloween a neighbor child, just starting the evening parade, came up our walkway. My children, who had decorated the yard for the season, called attention to our real Halloween showpiece, our very real garden spider. The child spied the spider, shrieked with fear, and, before any of us knew what was happening, took a stick to the entire web. The spider didn’t come back the next day or the next, or ever, her home destroyed by a fear I understood all too well. It was a fear born of ignorance, as most fears are. It was a fear I hadn’t realized I’d overcome until I saw it from the outside. For five straight Augusts, we’ve been looking for another garden spider, looking in vain through the herbs and shrubs to see if one has come back. This year one did. She’s on the side of the same gardenia bush, hidden from frontal view. Her anchor line looks solid, like it will survive until first frost. We check on her and comment on the changing zig zag each day, but we won’t be showing her off on Halloween or any other time. People, I realize, must come to their own terms with their own spiders. Each of us must find our own peaceable kingdom. What a great story. I have never been afraid of spiders and can never understand why others are, although I have an aversion to snakes. I do have one living in my wood shed that terrorizes me from time to time. I love how you got over your fear and learned to co-exist in harmony. Thanks. We have snakes and lizards in our garden also. The snakes somehow have never bothered me, but I don’t really want them slithering in my bed either! Peace. As I read your post, Charlotte’s Web came to mind…and then it was. We have Black Widows around our 105 year old house. I keep track of where they live and just let them be. They are actually quite beautiful.